we haven't search much yet into that topic and my first was to ask you guys if you done something like this. We are currently looking at a project where the UR would need to be moved on a rail. So far it is quite easy as the rail will have only two positions (one at each end). So the integration is quite simple. However I was curious to see how hard would it be to have the UR move on a servo driven axis? We are used to work with this on Fanuc robot where the axis is integrated to the system such that when you move a 6 axis robot on a rail, on the teach pendant there are 7 axis to move. So when you teach points, they record all 7 axis values. I am guessing that it would be feasible to make this work on UR but could be tricky. What do you think? Any experience you are willing to share? @Sebastien do you need to be moving the robot while you're moving the slide or is it move to one end and do some work then move to the other end and do some work there? We've looked at a couple of applications that needed a slide as well and have done a little noodling around how to make it work. I do wish that UR would allow for 7th axis control like other robots. Moving the robot to a certain position, do some work there and then move the rail to another position is something that could work in our case and I think is feasible to do with UR. However we would be interested to see if anyone tried a sort of coordinate motion between the rail and robot to have both move at the same time! We have toyed around with the idea but we have some advantage on that we have a seperate computer attached to each of our robots to enable something like that. To accomplish that we'd basically be monitoring the robot position in real time, calculating the current distance from the final point and then moving the linear slide in relation to that distance to get the accel and velocity required for the slide. We do have a robot running a 7th axis but it's not moving the robot, it's moving the part for the robot and there is some coordination between those two but it's limited in scope. I guess you could use the conveyor function ( you could effectively treat the conveyor function as your 7th axis) read in from a linear encoder or simply read the encoder pulses between the start and finish points programming your bot and io accordingly to respond when encoder reaches the required pulses which I assume would be the opposite end of your linear rail. 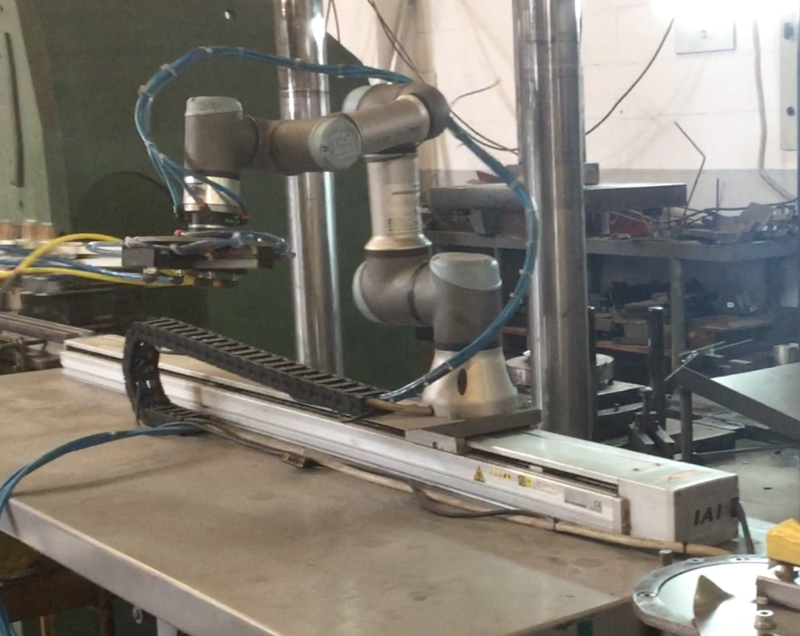 I saw that Numatic Engineering worked on a solution incorporating a UR robot on a linear actuator (Rollon Corp). @baghakian Could you share how you integrated the control of the robot with the linear actuator on this project? Since the UR does not have pulse output, we need to rely on discrete outputs to run the servo. The Yaskawa servo motor that I used was controlled by the "indexer" style controller. Multiple points are pre taught in the servo controller and through a binary discrete inputs, you can select which position to go to. Please remember that this will not be a true 7th axis. I had the robot moving while the linear actuator was moving (used a thread in the UR program). For a very straight forward solution without the need to do interpolated motion with the UR, we highly recommend IAI electric actuators - https://www.intelligentactuator.com. We already have several applications using them together with UR3 and UR10 with no issues. Strong points of IAI is a very extensive range and easy setup. You can "talk" with IAI by digital I/O or serial communication. If you want, we can suggest a model based in your requirements such as effective stroke, necessary speed, etc..
@carrondo would it be possible to get some ballpark prices for lets say a 1 meter and a 2 meter slide that can move at 1000 mm/sec? We have looked at a number of potential applications that would require a system such as this. Hi @matthewd92, IAI has more than 700.000 models so pricing is really a tailor-made subject. But a worst case scenario would be a 2m slider for a UR10 together with a controller it will come about 5k€ (one ballscrew unit, repeatability ±0,01mm, 1.080mm/s, 45kg payload with 0,4G acc/dcl). After finished all the electrical connections, the unit will be ready to run in less than 10 minutes. We also used them when we have a robot with dual grippers and the application needs the distance between grippers to be variable. We are looking at an application where we would have a UR10 on a rail. The robot needs to move to three different positions (one at each end and one in the middle). The distance between the two end positions is 2.5m. Where can I get quotation for your system for this application? 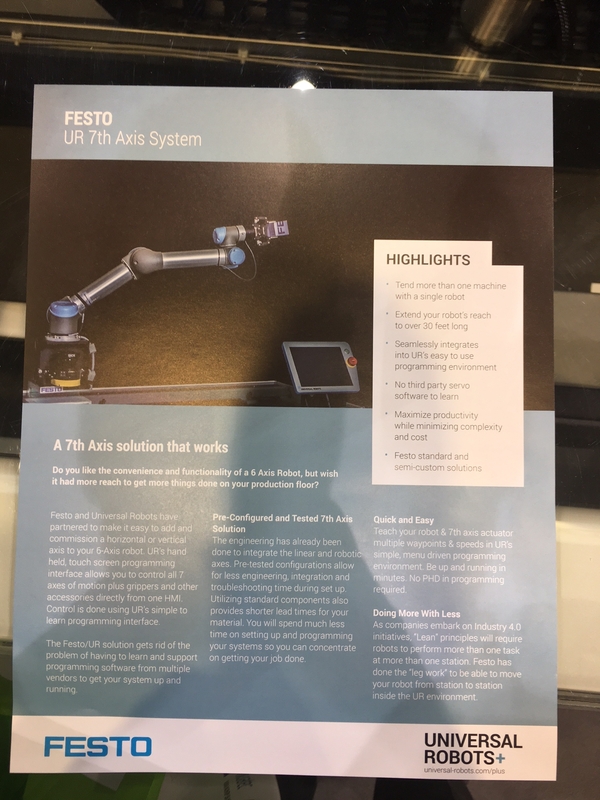 @Sebastian Festo is showcasing their system that's been designed to work directly with UR at Automate this week. Supposed to be able to mount vertically or horizontally and programmed directly in polyscope. We'll be there and I'll post something up after I see it. I just saw it. One of my contact at Automate stopped by the booth. I wonder how much it cost and how well it has been integrated! So it's built as a cap, you can control the positioning and speed from within a program node. It's not coordinated motion but rather point to point. So move the robot to position 1, do some work, move to position 2, do some work, etc. Just looking at it at the show it looks like a pretty nice integration. There are features they need to add to the cap such as force control and encoder counts but not bad for version 1. The way way they are making it collaborative at the show is adding some laser scanners to it that allow it to stop when someone gets too close. These are not included as standard so there's 5-7k just in scanners. Also, it can be up to 30' (~9.1 m) long. I'll try to get a video tomorrow if it and post. @Sebastien Do you have a local IAI representative? For your information we're also developing a URcaps for it. But will allow more flexibility to the user, not only to move a 7th axis. @matthewd92 Based in your feedback, moving point to point it's something very easy to do with IAI system. Have any of you moved forward with any linear slide projects? I am quoting on a job and would like to use a slide to access part pick and drop off. I like the simpler idea of moving it to pre programmed positions. Looking for 1 meter in length. We have not pulled the trigger yet on moving the robot, have a couple of cells with slides moving the part for the robot. We are looking at Parker and Festo currently but just found out about Macron Dynamics and we are investigating that route as well since you can use any servo and drive with it. We've written our own private adapter between a stepper and the robot for one of the projects so would like to potentially use the same or very similar adapter for this as well. I was looking at Macron also. One of my suppliers was demo'ing it to me about a month ago. What series were you thinking? Do you think MSA-14S will handle torsion well at full reach (UR-5)? Or are you looking at MSA-14H? Did you checked IAI? We have several running with all sizes of UR robots. Easy to setup and very reliable. In the photo we have a 1.4m effective stroke unit. @carrondo which unit are you using? I understand this is an old thread (1 year!) but I just thought it'd be useful to show you what we've done so far at Vention to allow for easy commissioning of a 7th axis for any UR model. You may have read it from Universal Robots at Fabtech this year, but we launched an easy-to-use Vention URCap to set your 7th axis position as you program your robot, directly from the teach pendant - i.e., no need for extra hardware. Hardware wise, we've created a basic configuration with the help of our motion partner, Thomson Linear, as well as some of our own timing belt actuators. Keep in mind that you can easily ask to change the lengths, width or even orientation of the axis via our online CAD & application engineering team. The original design can be seen here, pricing includes everything (all the hardware + URCap). I'd actually be curious to know what you guys think? @maxlavigueur does the price I see online include all the motion components, motor and controller? What length drive is that? What are you doing for overhead mounting as most of our customers floor space is precious and they are asking for an overhead gantry. @matthewd92 the price you see includes everything except for shipping: all of the hardware, motor, controller, etc. You can always enter any address (we ship global) directly from the website to see shipping options and pricing. Please note it can also be programmed using URScript commands for free. The length of the design I sent earlier is 1530mm (60in) but can easily be adjusted. Overhead mounts use the same motion components, but we adjust the structure based on the available supports at the ceiling. maxlavigueur - reviving this thread. Last time I spoke to someone at Vention you were working on getting the 7th axis to do coordinated movements - any update on that? Has anyone here found a solution for a 7th axis that does coordinated movements? It's on our radar and we are currently scoping the feature. We have been focusing on expanding our range (literally) of 7th axis, as you can see below. We'll definitely provide updates as we go!